← How Much Human Contact Can We Live Without? The following questions are to help us think about how much space we have to enjoy, and what if it were to be taken away. Do you live in a house or an apartment? How many rooms do you have? Does your home have a balcony or backyard where you can spend time outside? Is there a park in the area where you can go for walks or to sit down? What about restaurants? Do you go out for a bite or a cuppa coffee occasionally? Maybe you go out to see a movie every once in a while? Perhaps there’s a library or museum you like to spend time in. Visiting with friends and family in their homes is nice too. Shopping! Most people go shopping a lot. How many stores do you visit every week? Every month? Do you ever just hang out at the mall, especially if it’s too hot or cold to be outside or you get bored at home? What about doctors and dentists? Do you go when you need to see one? Church, temple, mosque, or synagogue? Maybe you go to school. Or have a job. Maybe you volunteer somewhere too. Do you ever drive across town? Do you go to the beach? Take vacations? Maybe you even fly to another country once in a while? When you need to or want to move, how easy (or difficult) is it to find a new home? How many places do you look at before you find what suits you? Are there other places you go occasionally or regularly? What if you got sick to the point of being disabled for days or weeks every time you stepped out the door? What if you were completely housebound? This entry was posted in Accessibility, Community, Disability, Environmental Health, Environmental Sensitivities, Housing, Human Rights, Imagination and tagged allergies, chemical sensitivity, environmental sensitivities, IAQ, invisible disabilities, MCS, MCS/ES. Bookmark the permalink. One of the saddest thing about all these toxic chemicals is that well meaning people seem to have the same response when they find out how restrictive my life has been. “Can’t you just wear a mask?” The first response isn’t: let me write my senator/congressmen or I’ll stop buying products with toxic chemicals or even what can I do to make this a safe healthy environment for EVERYONE? If everyone had to wear a mask for a little while, everyone might begin to understand why the people who fought for smoke free policies did that instead of expecting all non-smokers to just wear masks always and everywhere. 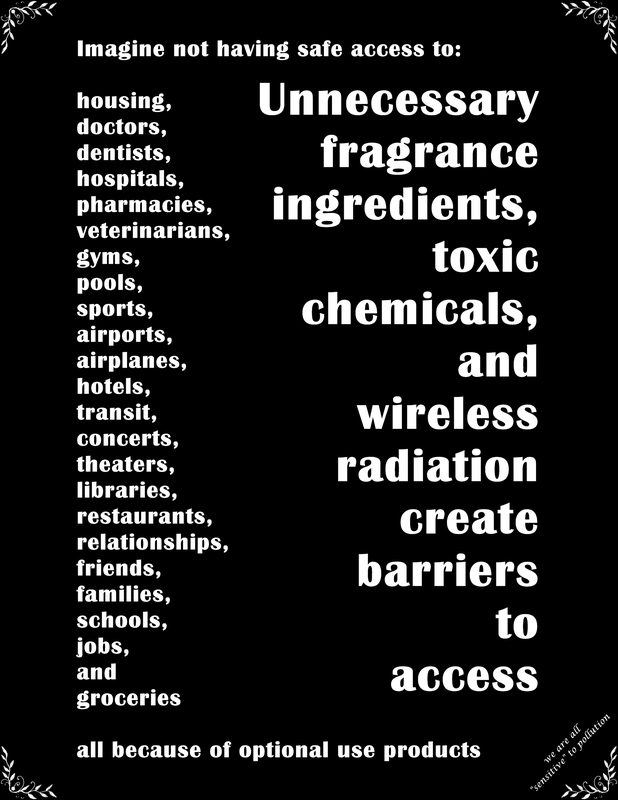 People who currently have fragrance allergies and chemical “sensitivities” due to all the harmful chemicals used in fragranced products shouldn’t have to wear masks when the problem is the products contain harmful ingredients that harm everyone’s health. I haven’t found a mask I tolerate, either. Even a cotton T-shirt/bandana that I tolerate itself, I feel like I can’t breathe, and very quickly the cotton picks up the smells around me…. I think I miss most: church, libraries, concerts, and restaurants. Maybe someday (?) I can go to a restaurant with outdoor eating space. I don’t have any tolerable cotton masks left that are presentable either. I hope you find a nice safe place to be able do something somewhat “normal” soon!